I am sorry for not writing many blog posts lately. Between work and wedding planning the words that normally bubble up in my head at random times like driving or showering have been absent. Or they’re on totally non-fun, non-blog worthy things. Like, did I remember to send in that accounting entry…or should I have one big cake at my wedding or several small cakes so I can buy 3 different cake plates and 3 different cake toppers. This doesn’t mean I’m any less horse obsessed. In fact, I spent all morning falling behind at work while looking at Horse Nation, and buying really expensive fancy tack for Savannah (in my mind). Also, Dover Saddlery is having their annual photo contest and that consumes at least one hour each day. September also marks my one year anniversary with my baby girl. The time goes so fast. Lots and lots of exciting things are happening with our training. We had a pivotal breakthrough moment with connection on July 12, the day before our last show. After months of frustration trying to “get” connection, in the middle of my lesson my trainer got on Savy to get her over her back and connected, with the hopes that when I got back on I could experience how it feels. While watching Nicole ride I saw Savy try to pop her head up out of the connection, and just as quickly she was back down. I asked Nicole how she did it and all she did was squeeze the outside rein. This was mind blowing! Mind Blowing! 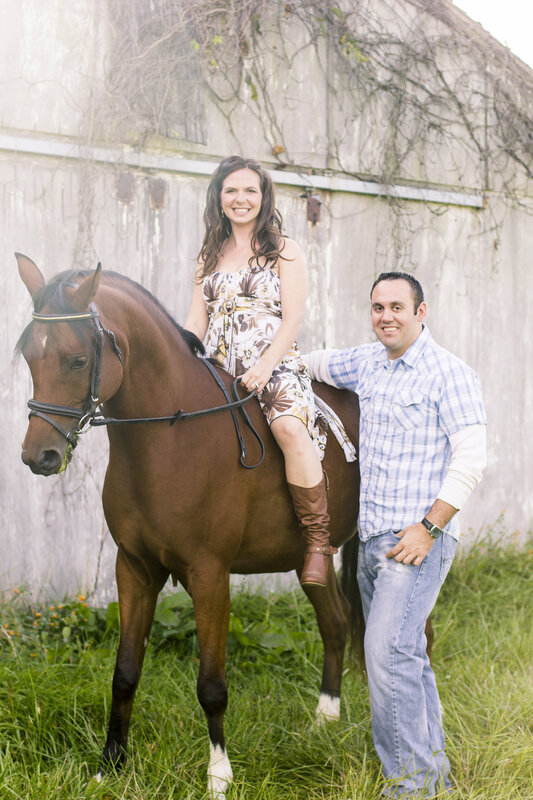 When Savy comes out of the connection with me I would frantically squeeze with both reins, kick with both legs and do something funky with my seat. In other words, way over react. Since then things have started progressing nicely. We start each ride long and low, with her stretching over her back, and most importantly, NO attitude. She does not get fussy when I pick her back up for more serious work, and we’ve been working on some really exciting things! We’ve started asking her to sit back a little bit and take longer strides – the beginnings of a lengthening, and she’s doing baby leg yields. And the canter! 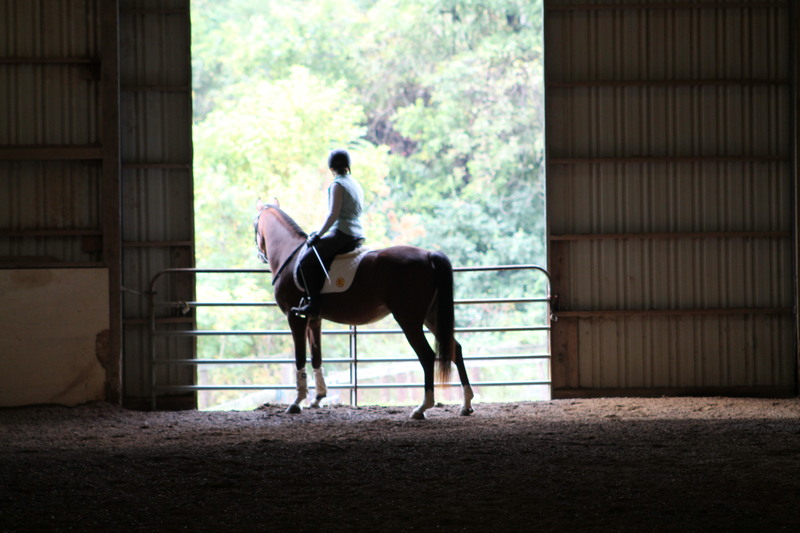 We can canter without feeling like either one of us are going to fall. She still has a lot of strength to build to properly do the new things we’re asking of her. The mini lengthenings are very tiring for her and we can only really work on the canter one direction because she’s too tired to do both. She’s a rock start with the leg yield to the left, but still hasn’t figure out how to go sideways while staying straight to the right. She wants to fall out through her right should and it might just be a strength issue. We got a few correct strides out of her last week and as Nicole said “it’s enough to build on”. 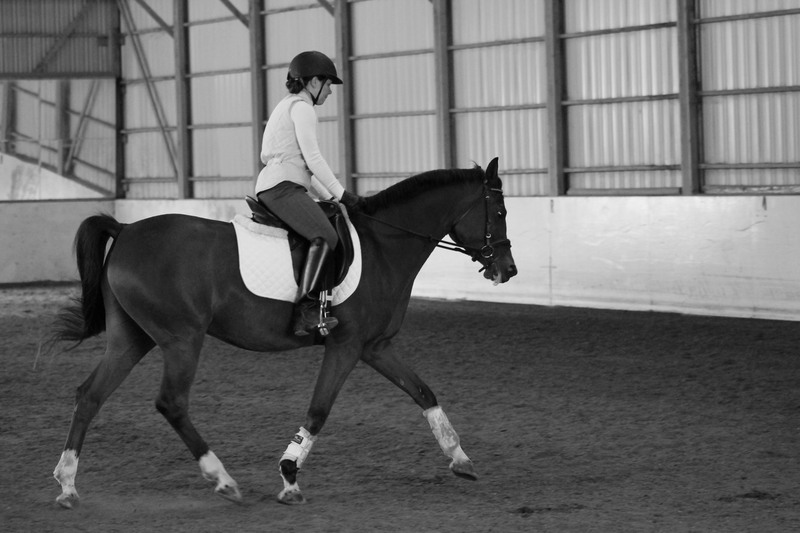 Here’s some video of us cantering. She was fussy here, but it’s still a lot better than her bucking. 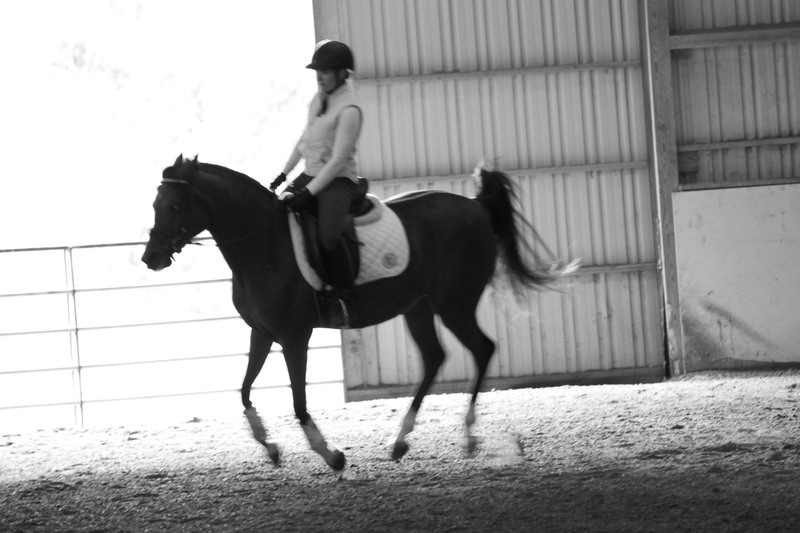 The second video is our warm up trot. She’s able to stretch a little over her back right from the beginning! !